This item is currently NOT available. When and if it becomes available, we'll update the availability message accordingly. The players take on the roles of the heads of influential families in Paris at the end of the 14th century. In the shadow of the Notre Dame cathedral, the players compete for prosperity and reputation. Each family controls one of the 3 -5 boroughs that surround the site of Notre Dame. As head of his family, each player tries, through clever use of his action cards, to advance the power and prestige of his family, but penalties are assessed those who do not take care of the health of the people who live in their borough. The player with the most prestige at the end is the winner. Products that other customers purchased when purchasing this item. Customer Raves - Write your own Rave about this game! (Click on a person's name or game group to see other raves by the same person or group. This is my favorite strategy game by far. I love the challenge of balancing money, influence markers, and fending off the plague-spreading rats. It kills me to pass some of my good cards to my opponent but I enjoy trying to make the best choice to maximize my game. And you never know what your neighbor will pass you. This card-drafting mechanism makes it a lot of fun. Once you get the rules down, you can play a serious game in under an hour. Check out the Rio Grande Treasure Chest for a good expansion. Quirky idea -running around Paris all the while having to avoid being overrun by a plague of rats. The French might not appreciate the joke but it's a very clever game with some innovative card draughting mechanism to mix up your possible actions. This game works at all levels from family beginners to cut throat human calculators. Notre Dame actually reminds me of another great game - Yspahan. Although the games have a very different feel to them, they share the race to maximise your actions in terms of victory points and making the most of very limited ressources. What makes Notre Dame stand out, however, are the inclusion of person cards, that each have a large impact on your options. These appear semi-randomly which adds a nice element of variability without making the game feel as luck dependent as Yspahan. 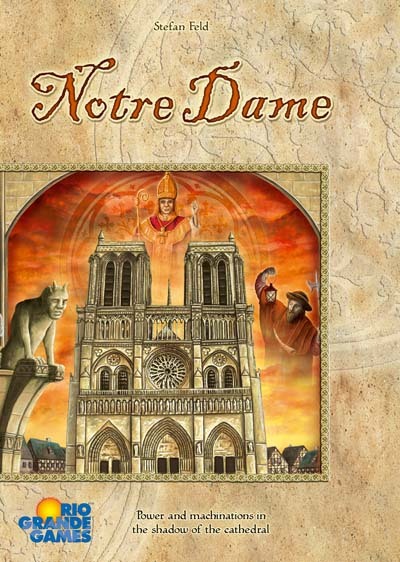 Notre Dame is a very refined game with a nice flow and great components - a must for fans of Euro style games. Well, I finally played this game (and have done so many more times!) and it is fantastic! Mix in some card drafting, a little long-term planning, a whole bunch of tactical choices (particularly in whom to hire at the end of each round), and a little dash of the Black Plague, and you have a wonderful experience! The best part about this game is, even with all of the choices and depth, the game still clocks in at a very reasonable 40ish minutes for us when we play!